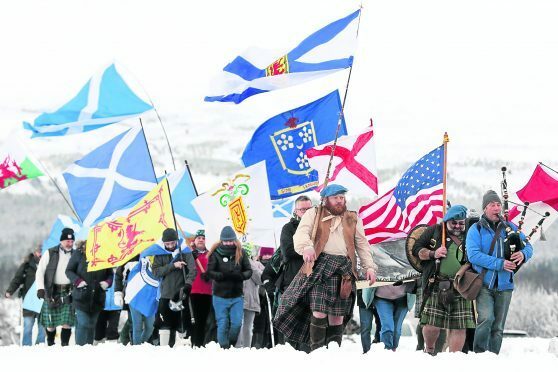 Protestors marched from Culloden Battlefield to the site of the controversial proposed housing development. Protesters opposed to 16 homes being built next to the historic Culloden Battlefield are delighted the revised plans will now be debated in public. Inverness councillors representing the area have successfully had the latest proposal put on the agenda for the local authority’s south planning committee to consider – rather than it being dealt with by officials under delegated powers. The original application for the housing development at Viewhill Farm was initially rejected by Highland Council, but the decision was overturned on appeal by a Scottish Government Reporter in 2014. This prompted outrage across the globe, including from fans of the hit TV series Outlander, as well as from its author, Diana Gabaldon. A new developer, Aberdeenshire-based Kirkwood Home, recently took on the project and has submitted a revised application for the design of the houses, while a separate application for the road layout has also been submitted. These were to be determined under “delegated powers” by planning officials, a move introduced to help speed up the planning process. But such has been the controversy, local councillors Ken Gowans, Carolyn Caddick and Andrew Jarvie have successfully had the application placed on the agenda for the south planning committee, allowing it to be debated in public. George Kempik, founder of the campaign organisation the Stop Development at Culloden Group, said: “This is the right thing to do. “The public have a right to have a say and hear a public debate on these controversial proposals. He said plans were already underway to arrange a protest at the Highland Council HQ prior to the meeting. He added: “We continue to be totally opposed to this development, which sits just 400 metres from the Culloden Battlefield Enclosure and is where the last pitched battle on British soil took place. A spokesman for Kirkwood Homes confirmed the developers had submitted two planning applications to Highland Council regarding the proposed development.